Hire a campervan / motor homes with a Bike and enjoy Cycling around the stunning countryside of New Zealand which will expose you to the untouched beauty that it has become so famous for. Make the scenery last longer and explore back country roads, fabulous landscapes and remarkable highways with the freedom a bicycle offers. 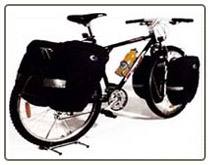 We stock a variety of new and used bikes at very reasonable prices for sale, hire, or rental sale. We provide Road Bikes, BMX bikes, Mountain bikes - also Ladies bikes, Cruiser bikes, Children bikes, Full Suspension, Tandem and high quality racing bikes. We offer a 12-month warranty; customers are totally risk-free. There are many other benefits, including three free service checks and our 50% buy back guarantee up to 6 months from the original purchase date.